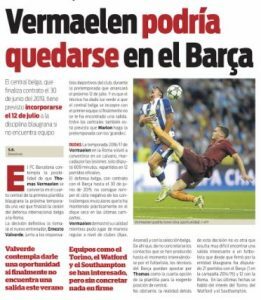 In one of Barcelona’s endless efforts to improve their defence, it didn’t look like things would go terribly wrong then signing Thomas Vermaelen from Arsenal in 2014. 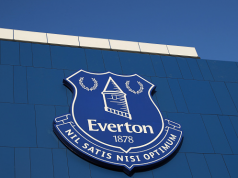 The player had impressed in the Premier League, and seemed like a decent addition to the Catalan squad. Barcelona’s one worry was fitness, and that proved to once again be a problem for Vermaelen. In two years, Vermaelen only made 21 appearances for the club, and was sent on a loan to Roma last summer. The spell wasn’t impressive either, as due to his many injuries he only played 12 games in Italy. However, he still could have a chance at Barcelona, at least according to Sport today, but that’s only if clubs like Southampton and Watford don’t pursue their alleged interest. New manager Ernesto Valverde has given the green light for him to join the first team squad while the club doesn’t sort out his situation. Barcelona’s priority is to sell him, but there aren’t many options for now. Sport recalls that Torino, Southampton and Watford have all been linked to the player recently, but there isn’t an idea of who would be close to signing him. These clubs haven’t made their moves. It sounds like Barcelona would hope Southampton and/or Watford interest is genuine, to allow them a chance to move the player on.